Do you believe in the study that predicts your future & analyzes your personality on the basis of body construction & feature? Do you want to know whether a man is rich not by looking into his wallet? A new study says that the size of fingers can best identify the man. Researchers at the Concordia University in Canada found that the ring finger or the Index finger of a man's hand symbolizes that man is rich or there is a chance to get big amount of money in near future. The longer ring finger also tells that the man is a hard working & supportive with handsome of money & with a potentiality to win a girl’s heart. It is a kind of prediction that a scientific study also believes. Researchers said that a man with long index finger as compared to other fingers is the most reliable & a woman can trust him blindly. The study says that the testosterone level usually affects the finger length. But men's personality is also linked to the testosterone. The higher testosterone levels in a man makes him a bigger risk taker & stronger while playing in stock market kind of business. The study published in the journal Personality & Individual Differences, found the personality differences conducting experiment with 415 men & women. 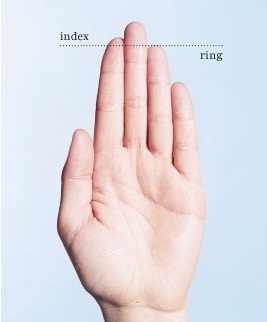 However, women behaviors do not matter with the differences in finger lengths.